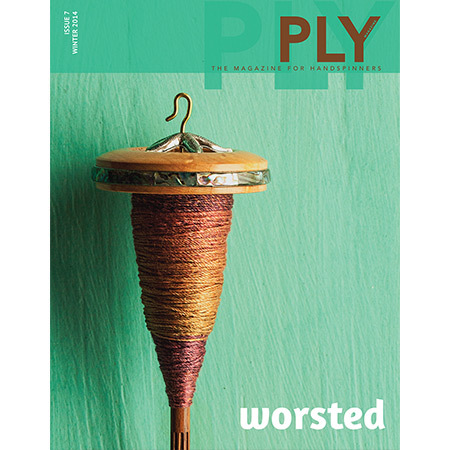 ‘Ply’ magazine’s Winter 2014 issue, “Worsted”, has my snakey handspun inland gansey and I wrote a piece to accompany it. I spun/plied the yarn in around 12 hours. Having read an assertion by my favourite blowhard blogger who claimed to spin the yarn for a gansey in 30 hours, and the suggestion that anyone who can’t, is Not A Real Spinner. I wanted to see what was possible. I don’t normally time myself spinning, it has to be said. I don’t truly care how long anything takes me, so after thirty odd years of doing this had not a clue how long it takes me to spin a sock let alone a gansey! So when I timed, I got a pleasant surprise. If you try this at home, relax, enjoy, and rest assured that however long this takes you, and however much life intervenes – you will get there and the results will be great. I arrived at a rather eccentric way of plying; threading each ply through a flat iron; three old flat irons dotted around the living room floor. 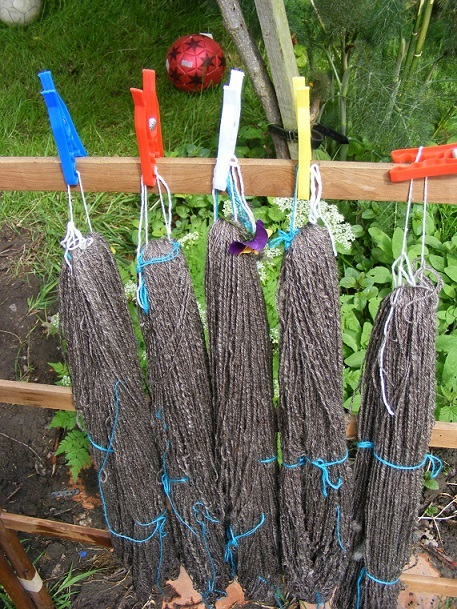 Any heavy object with a hole you could thread the yarn through, would work – I passed it under the flat irons’ handles – used flat irons as they are heavy and I could place the three a long way apart from eachother, and so maintain plying tension. I wish I had photographed this. I used some common inland gansey motifs to make up a fairly repetitive pattern and then spent a couple of weeks watching 1970s’ ‘Grange Hills’ on YouTube, and reading books as I knitted. I read my favourite book of the year, ‘Put Me Back On My Bike: In Search Of Tommy Simpson’, by William Fotheringham. Like all lengthy projects, you associate the thing knitted forever after in your mind with the things you were reading/seeing/doing during the making. ‘Put Me Back On My Bike’ tells the story of the incredibly talented 1960s’ British cyclist, Tommy Simpson, who was a world champion cyclist and for the first time in the Tour De France’s history, gave the Brits a glimmer of hope of winning the Tour, wearing the yellow jersey. Tommy literally cycled himself to death on Mont Ventoux, in 1967, where he died, on camera, as he almost reached the summit. It is rumoured that his last words after he had zigzagged off the road, were “Put me back on my bike”. A combination of alcohol and amphetamines were found in his system – these things were not unusual for the 1960s’ professional cyclist. Tommy was often called a Yorkshireman or ‘Tyke’, as he lived and trained near Doncaster but he was born in the Midlands. I felt he was one of our’s, though. All this reading about 1950s/60s cycling culture, led me to start investigating cycling jerseys – shapes, styles, colours. I’m hoping to work on something inspired by them, very soon. There were points during the marathon gansey spinning and knitting weeks, I felt like I was doing the Tour de France – day in, day out, getting on with this Big Project. It was a relief to be out the other side, but I was very quickly itching to spin and knit again, afterwards. A case of ‘Put me back on my spinning wheel’. 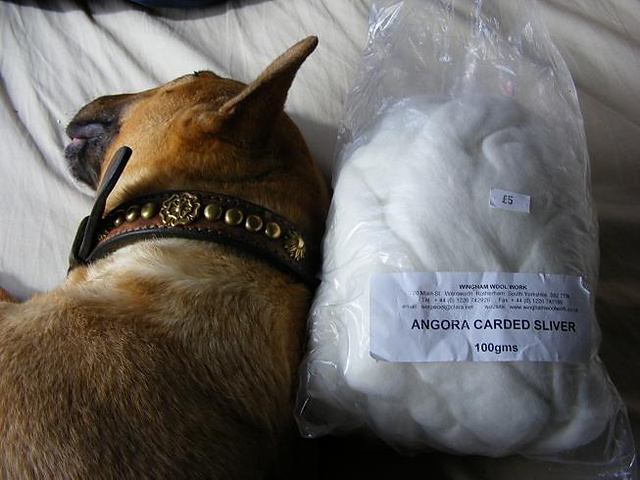 Around the time I was working on this, my 14 year old bull terrier was very obviously coming to the end of her time, and when I knitted, she sometimes sat next to me. 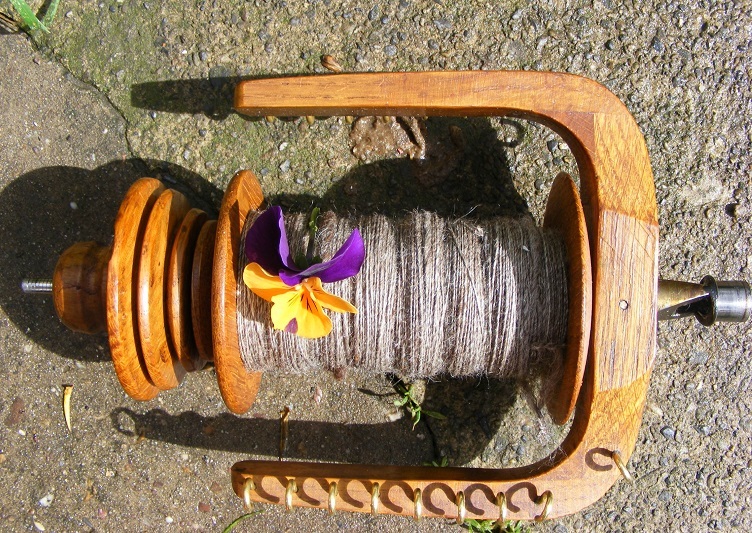 When I spun and plied, she was a few feet away. She came so far with me, for so long. Around the week FedEx picked up the finished sample, she went away. Everything I have designed or made for the past 12 years, she was snoring next to me. So memories of her are spun into this, too. My usual favourite heart motif is for her. A few months on, here it is in print. With no mention of Tommy Simpson but he was very much in my mind as I knitted the gansey and I will think of his story every time I look at it! No mention of my beautiful girl, either. But for me, it is there in every stitch. I think for knitters and spinners many of the things we make are inextricably woven together with the time in our lives when we made them. I recently mended a gansey I had knitted in the 1980s and working on it a second time, gave me a slew of new memories to add to the old. The lovely Tom of Holland writes of this in his visible mending projects. In the accompanying piece, I walk you through selecting the wool, how to figure out grist, how to figure out your best number of twists per inch and ply twist, amongst other things. I went with BFL because it is a soft longwool, has a buttery sort of hand to it – and, let’s be pragmatic – is probably more easily available in some parts of the world than say Cotswold or Wensleydale. ‘Ply’ is a beautiful magazine; well designed and well put together. I am really proud to be in the company of its contributors in this issue and working with Jacey was a joy. It’s not often I’m so overt as to say – go buy one. But. for my textile friends.. go buy one. Charm, doing what she did best – snoozing! It is such a truth that our memories are a tangible part of the things we make……thank you for expessing this in such a lovely way! Congratulations on your article in Ply. I love your snaky gansey! And I’m impressed with your speedy spinning skills. 😉 Congrats on proving that blowhard is full of hot air. I’m so sorry your beautiful dog is gone. I got to spend today, with a group of wonderful friends – spinners, weavers and knitters and my favorite dog, who belongs to my friend who hosted the party. The dog is close to the end of her life so it was hard to say goodbye to her. All the very best for the New Year and the rest of 2015. Your posts are brilliant, I have enjoyed them very much, fascinated by the flat irons! Very sorry about the dog, our pets become a bedrock to our lives and rightly so. Take care. What a lovely post. Thank you for sharing it with us. So very sorry about your dog. It’s a hard time of year to lose loved ones. And yes, you should have taken a shot of your flat iron maze! Peace and Joy for the New Year.